Once again, I am unable to resist Trader Joe's cute packaging. This box is just too, too cute! 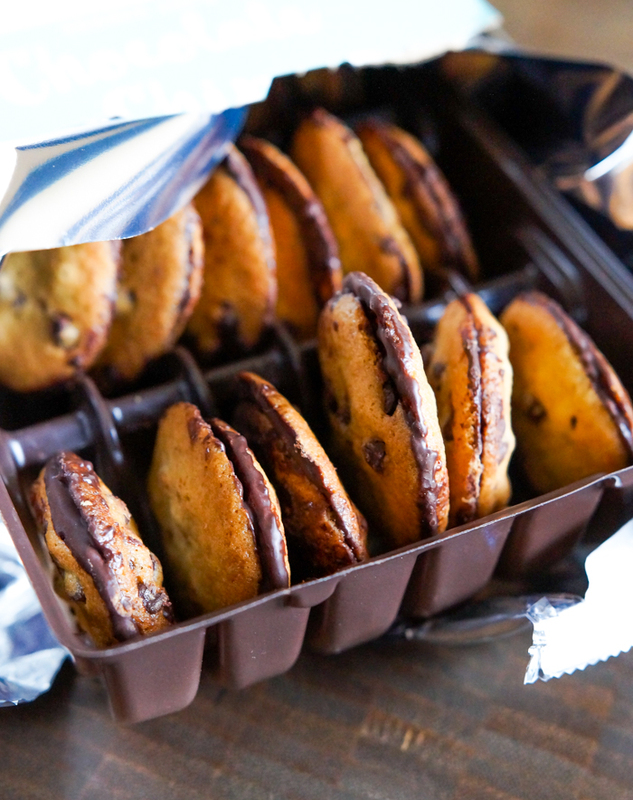 Trader Joe's Chocolate Chip Sandwich Cookies come in a box with a tray inside...each cookie has its own little nook. An 8-ounce box costs $3.99. 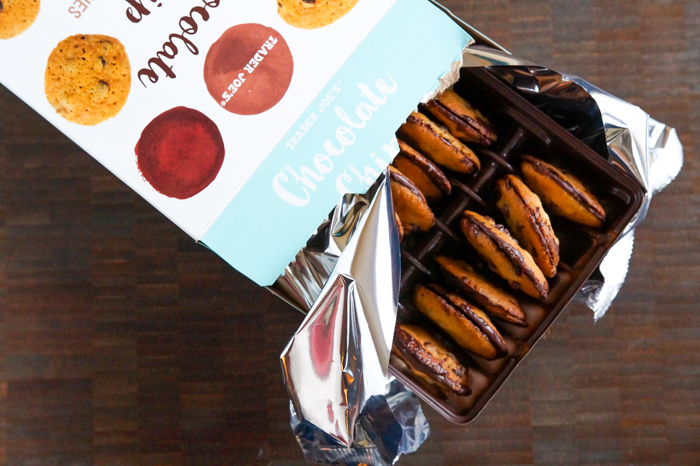 A mom's (my) take: On first look, these remind me a lot of Milanos...thin cookies sandwiched with a swipe of chocolate. These are crispy, buttery, and really good. 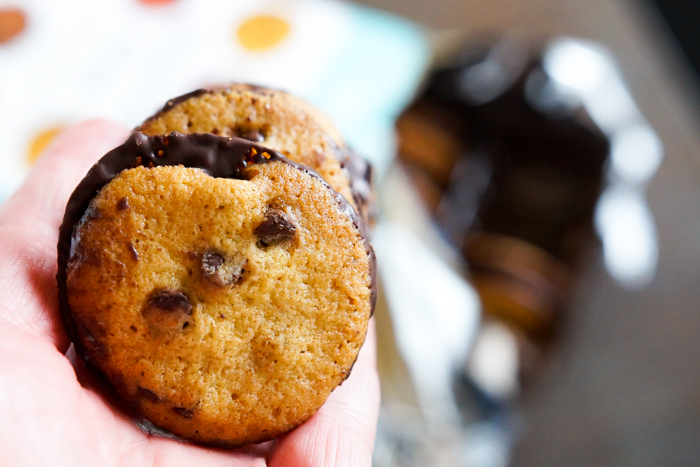 The cookies have that classic brown sugar flavor and the chocolate filling is rich and satisfying. 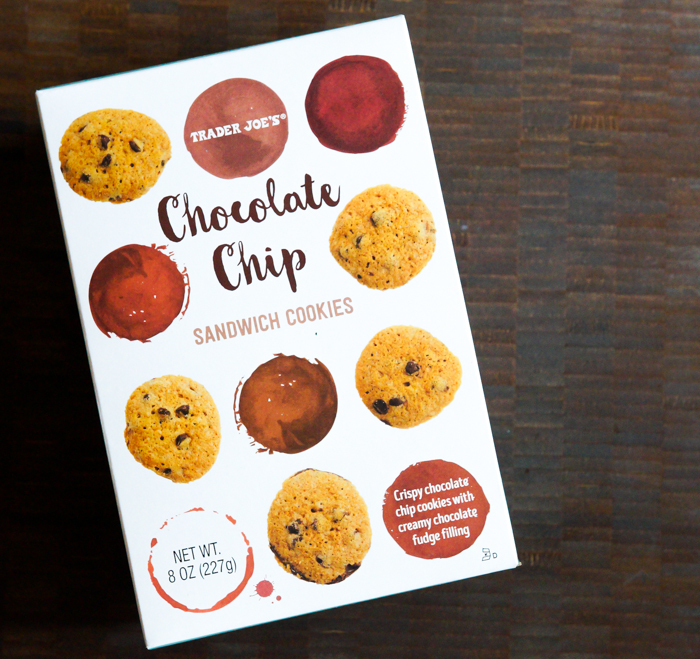 If you're a fan of crispy chocolate chip cookies, I think you'll find these hard to resist. A teenager's (Jack's) take: Trader Joe's hit the sweet spot! There are two things I love about these cookies. One is the consistency: the outside of the cookies are crispy, but once they give way, the inside isn't that crunchy. It's always nice when a cookie doesn't fracture into a million pieces after you spend several seconds trying to bite into it. Also, the flavor is magnificent! The chocolately goodness seems to permeate your whole mouth, even before you get to the majority of the chocolate which is sandwiched in the middle. Overall, these little guys pack a (sweet) punch. Exercise caution. We love your TJ posts! These cookies are a new favorite at our house. Again I wish I had a TJ's here. I love your TJ posts! I'll have to try these! I would love it if you'd take a picture of the nutrition/ingredients label....is that something you'd be open to doing? I have family members with different allergies, so it would be great to know ahead of time who could eat the treats. Thanks! Nice post TJ. I will try these cookies in my house. I love this! Chewy... Delicious... Eas... What’s not to like? I love your TJ's posts! Thank you for introducing me to these cookies based on your review. I've bought so many boxes to share with friends and family because they are so addicting!